A report from UK-based newspaper The Guardian says that British Government-backed projects to tackle the aftermath of the war in Iraq have been hindered by the UK’s continuing “hostile” immigration policy. It cites the example of a civil service training scheme involving a £330,000 contract between the General Company for the Ports of Iraq (GCPI) and Middle East Graduate (MEG), a Sheffield-based student recruitment agency; the scheme now faces being axed after immigration officials rejected dozens of student visa applications. Another project, funded by the UK government to research gender-based displacement and violence in Iraqi Kurdistan, was hampered when six members of the project’s Iraq-based team were denied visas. Posted in featured, General Company of Iraqi Ports, Iraq Education and Training News, Iraq Industry & Trade News, Middle East Graduate (MEG), United Kingdom. Japan’s Mitsubishi Corporation has been awarded a contract for port construction in the Republic of Iraq. Extended by the General Company for Ports of Iraq (GCPI), the contract covers a port rehabilitation project in the country’s southern region of Basra, and is valued at approximately 110 million US dollars. The project is being funded through ODA loans provided by the Japan International Cooperation Agency (JICA). The project will be executed through a partnership between MC and multiple international contractors, including Turkey-based energy infrastructure provider Calik Enerji (CE), in which MC holds shares, and construction firm Gap Insaat, also Turkey-based. Both part of the Calik Holding group, these two sister companies will play a major role in executing construction while MC will be responsible for overall project coordination and serve as the prime contractor, facilitating the import of steel structures and other necessary supplies from Japan. The objective of this project is to modernize existing industrial port facilities around Basra by (i) expanding the oil products berth at Khor Al-Zubair Port, and (ii) building a new service berth for working ships and service boats at Umm Qasr Port. The rehabilitation of ports throughout Iraq is essential to meeting increasing demands for port infrastructure, which is growing rapidly as the volumes of trade flowing in and out of the country grows. Rehabilitating this critical infrastructure will also contribute to further stabilizing the country’s economy as post-war reconstruction advances. This project is particularly noteworthy given that Khor Al-Zubair and Umm Qasr are the only ports currently in operation in the Basra region, where a system of ports located in the 48 kilometer wide tip of the country wedged in between Iran and Kuwait along the Persian Gulf gives Iraq its only outlet to the sea. In addition to this project, MC intends to continue leveraging provisions under the Japanese Government policy framework for promoting export of “high-quality infrastructure” to identify opportunities that support Iraq’s efforts towards reconstruction, economic development, and increased quality of life. Posted in Al Basra, Basra, Basra News, Calik Enerji, Construction & Engineering In Iraq, featured, GAP, GAP Construction, General Company of Iraqi Ports, Iraq Transportation News, Japan, Japan International Cooperation Agency, JICA, Khor Al-Zubair, Mitsubishi, Ports, Turkey, Umm Qasr, Umm Qasr Port, WW. Sri Lanka’s Colombo Dockyard PLC (CDPLC) has successfully secured a contract with Toyota Tsusho Corporation (TTC) of Japan to build two vessels; Pilot Station Vessel and Buoy Tender Vessel, for General Company for Ports of Iraq (GCPI). TTC and GCPI signed the Prime Contract on 27th April 2018 in Dubai. Subsequent to the signing of the Prime Contract, TTC signed the Sub Contract Agreement with CDPLC as TTC’s preferred Shipyard for the construction of these vessels on 2nd May 2018 in Japan. TTC is a trading and investing company which is also a group company of TOYOTA. By recognizing the potential of CDPLC, TTC decided to collaborate with CDPLC for this project to compete and submit bid proposals in response to a tender floated by GCPI in July 2017. After the selection of the Bid proposal submitted by TTC in collaboration with CDPLC, there were contract negotiation meetings in Basrah, Iraq and in Colombo, Sri Lanka. These negotiations and discussions were able to strengthen the relationship between the parties to enter in to a successful contract. Both the Pilot Station Vessel and the Buoy Tender Vessel will be constructed using modern technology and will be in accordance with latest rules and regulations of the maritime industry. Both vessels will be classed to Nippon Kaiji Kyokai (ClassNK). The Pilot Station Vessel is a catamaran type vessel which will be used to transport of pilots and provisions, to provide pilots with accommodation services and to provide station and necessary support for pilot boats. This is a 50m length vessel with a breadth of 18m and a depth of 6.1m. The vessel is driven by two powerful diesel engine and shall develop a speed of 14 knots. The vessel shall be fully air-conditioned and shall provide accommodation for 47 persons. The Buoy Tender Vessel is designed to be used to retrieve and launch marine navigation buoys, to provide repair and maintenance to marine navigation buoy, to transport marine navigation buoys and/or spare parts and to transport general cargo. This is a 60m length vessel with a breadth of 12m breadth and a depth of 4.6m. The vessel is driven by twin diesel engines and is capable of achieving a speed of 12 knots. The vessel also shall be equipped with a Crane with a lifting capacity of 22 tons. This vessel too provides fully air conditioned living quarters for its complement of 29 persons. The two vessels are to be delivered in Iraq in April 2020. Posted in Basra, Colombo Dockyard, DUBAI, featured, General Company of Iraqi Ports, Iraq Industry & Trade News, Iraq Transportation News, Japan, Sri Lanka, Toyota Tsusho. UK-based WRA and Associates has announced the signing of a contract with the General Company for Ports of Iraq (GCPI) for a new $350-million facility with 3-4 berths at the port of Umm Qasr, in Basra province. Built in partnership with local company Bur Al-Aman (BAM), the new development will include warehousing and all other operations facilities, and will have an operating value of approximately $1.5 billion over the 38-year contract. The three berths will be built in two phases, incorporating three stages; each stage is the construction of a berth with a 200-m long sea interface with storage yards attached to it. Preparation of the berths and storage yards with the equipment and machinery specified and the technical presentation according to the specifications, is to be developed. With the infrastructure in position, Umm Qasr Port is in a good competitive position to develop deep-drafted dry-bulk, liquid-bulk and container terminals through private sector participation, and provide better facilities and services. Design works are to start immediately, and the project will be run on a Finance, Build, Own and Operate basis. Posted in Basra, Bur Al-Aman (BAM), Business, Construction & Engineering In Iraq, featured, GCPI, General Company of Iraqi Ports, Iraq Transportation News, Ports, United Kingdom, WRA and Associates, WW. 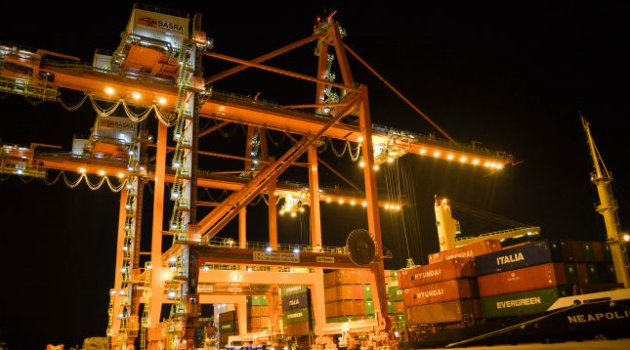 Philippines-based International Container Terminal Services (ICTSI) is investing $130 million in Umm Qasr port, according to a report from Reuters. The Manila-based port management company signed a contract with General Company for Ports of Iraq involving the container facilities at Umm Qasr; it will operate, develop and expand the port. The three-stage project involves constructing three quays that can handle a cargo of 1,500 containers, in addition to storage yards and installation of six gantry cranes, two for each phase. “The estimated cost of the project is $140 to $150 million for each stage. Each stage involves construction of a quay and a 200,000 square metre yard opposite to store containers and machinery, which are used to load and unload vessels. ICTSI will also build a new container and general cargo terminal in the port for a 26-year concession period, and provide container and general cargo terminal services. According to the head of media relations at Iraqi Ports Company, Anmar al-Safi, the three-phase project will lead to a shipment capacity of three million containers. The first quay should be operational by August. Posted in Commission, Construction & Engineering In Iraq, featured, General Company of Iraqi Ports, International Container Terminal Services Inc (ICTSI), Iraq Transportation News, Philippines, Umm Qasr, Umm Qasr Port. A new 30-percent customs tariff in Iraq is reported to be slowing business at the port of Umm Qasr (pictured), which handles 80 percent of the country’s imports, choking the port with thousands of uncollected cargo containers. But according to the report from Reuters, the new rate does not apply in Iraqi Kurdistan, which charges just 5 percent. Anmar al-Safi, spokesman for the General Company for Ports of Iraq, said the new tariff, which was approved by the Council of Ministers, impacts all imported goods, including foodstuff, and criticised the government for not applying the law to the Kurdish region. Posted in Business, featured, General Company of Iraqi Ports, Import tariffs, Iraq Industry & Trade News, Kurdistan News, Ports, Umm Qasr. The Philippines-based International Container Terminal Services Inc (ICTSI) said on Thursday that it signed a contract with General Company for Ports of Iraq, agreeing to operate, develop and expand the Port of Umm Qasr. In a stock exchange filing, the company said the contract grants it the right to manage and operate the existing container facility at Berth 20 for a 10-year period. It will also build, under a build-operate-transfer scheme, a new container and general cargo terminal in the port for a 26-year concession period, and provide container and general cargo terminal services in both components. It will invest $130 million in the first phase of the deal. Reuters reports that the port has 21 berths, with container throughput totalling 500,000 Twenty-foot Equivalent Units (TEU), in 2013. It said the expansion project would involve an initial 200 meters of quay with an estimated capacity of 300,000 TEUs. The capacity will expand to 900,000 TEUs when the facility is fully developed with 600 meters of quay, ICTSI said. Posted in Construction & Engineering, General Company of Iraqi Ports, International Container Terminal Services Inc (ICTSI), Philippines, Ports, Transportation, Umm Qasr.